When a small paint scratch marks the finish of your Toyota, there's now an easy way to fix it yourself with new Toyota stickerfix™. Making a minor paintwork repair with Toyota stickerfix™ is simplicity itself. Just clean the area, apply the adhesive film, and smooth it down - that's it. To see how easy it is, watch this short demonstration. The adhesive film has been designed and tested with the same stringent standards as every Toyota Genuine Accessory. 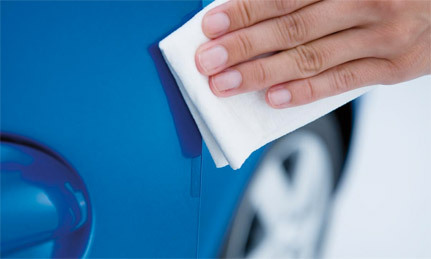 Toyota stickerfix™ is resistant to UV radiation, extreme heat and cold, carwashes and spilt fuel. And if you ever need to remove the film, simply peel it off with the aid of a hairdryer. Toyota stickerfix™ can also be used to avoid scratches in the first place, giving added protection for vulnerable areas such as door edges.